Drive through the still streets of downtown Edgartown on a winter morning and you’ll see them: dozens of shrubs and trees wrapped in burlap. Here, running along Simpson’s Lane, is a formidable flat-topped barricade, high as a moat’s wall. 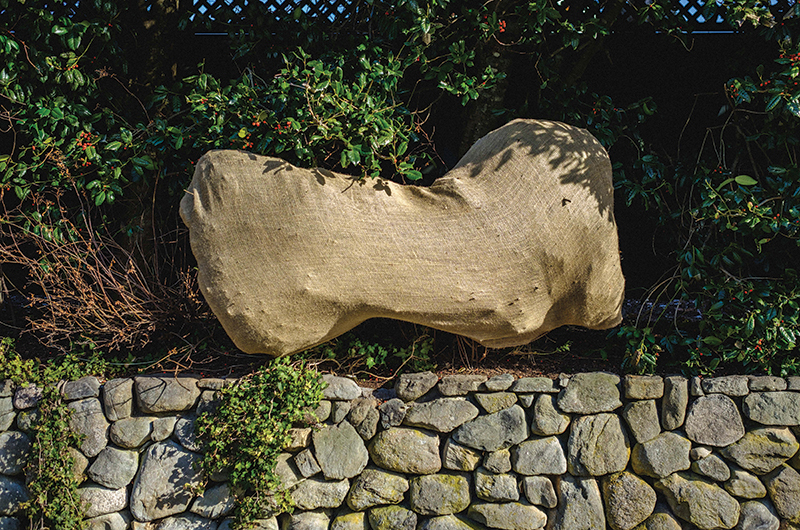 There, on Summer Street, flush against the façade of a handsome clapboard house, is what looks like an enormous dog bone, or a barbell; on closer inspection it’s three short shrubs, side by side, wrapped as one bundle. Next to it, an enormous sarcophagus (a holly tree, it turns out) leans against the house. And there, a high hedge, made up of shrubs that have been individually tucked in at the bottom, looks like a row of giant molars. Huge caterpillars -– low-lying rows of covered-up dwarf boxwood – are everywhere. More billowy, freestanding evergreen bushes look like lumpy, clumsily wrapped Christmas presents. Hello, why are the plants all wrapped up? What’s going on here? Has a Christo acolyte – or who knows, Christo himself – made a stealth trip to the Vineyard? Why didn’t anyone tell us he was here? Or is there something wrong with the plants? Is the burlap a giant Band-Aid, swaddling them because they’re sick? No, they’re not sick at all. In fact, keeping them from getting sick is what wrapping these evergreens is all about. Off-Island, the practice of burlapping evergreens is becoming increasingly popular: in the Hamptons landscapers seem to have run amok, wrapping every evergreen in sight; and Martha Stewart battens down virtually every tree and shrub on her Bedford, New York, estate. (Take a look at her blog if you doubt it.) 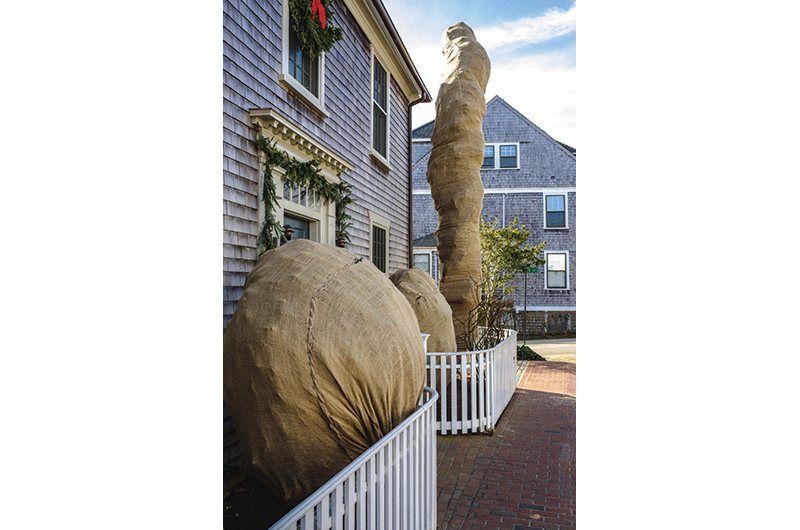 Here on the Vineyard, however, some experts and landscapers feel that wrapping trees and shrubs is over-coddling. Others say that if a client can afford it, and if the trees and shrubs are particularly vulnerable, wrapping can be a good way to go. Many of those clients live in Edgartown, and many favor boxwood. The dense, dainty-leaved evergreen shrub is ubiquitous in that town, where fastidious lawns and gardens often feature it trimmed into plump, shapely spheres or planted in tall orderly rows or as low-lying borders and frames for gardens. English gardens abound in boxwood, and Donaroma’s, the forty-one-year-old Edgartown nursery and landscaping company, whose garden designers specialize in an English “look,” design and tend to many of them. (Not all boxwood planted by the nursery is, technically speaking, English boxwood; other varieties include American and Korean boxwood.) Donaroma’s wraps for clients elsewhere as well – downtown Vineyard Haven has plentiful boxwood plantings, and Chilmark has some – but boxwood is used less beyond Edgartown, particularly up-Island. Edgartown is the boxwood epicenter of Martha’s Vineyard. On a chilly December morning, DeVane, who has worked at the nursery for twenty-two years (and in her off-work hours runs the Island Autism Group), visits a handsome Greek revival house on Fuller Street. There, a Donaroma’s crew of three is finishing wrapping several rows of trimmed, rounded boxwood that rim a small front courtyard. 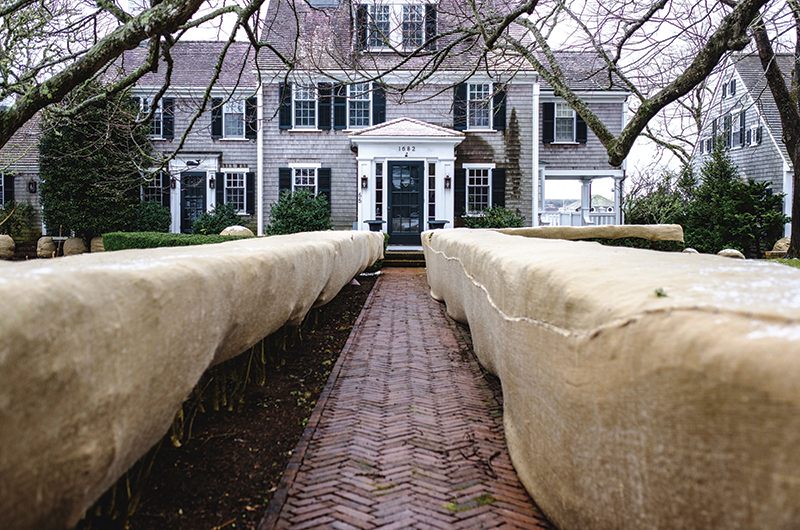 One reason to burlap is to prevent the damage caused by snow loads. Here at the Fuller Street house, for example, some of the boxwood shrubs are in the line of possible mini-avalanches – snow that slides off the roof after a serious snowfall. The wood in boxwood isn’t particularly strong. “All the snow off the roof splits them right open,” says DeVane. Snow kicked off by snowplows, or simply a heavy snowfall that dumps heaps of wet snow on top of the shrubs, can also hurt boxwood – particularly young or recently transplanted shrubs, but also ones that have been in place for years. “A row like this,” says DeVane, pointing to a boxwood border on the Fuller Street property, “that’s been in for five to ten years, you want to make sure one [shrub] doesn’t die.” One dead shrub in the row would be as appealing as a missing tooth in a grin, and boxwood are slow-growing, not easily replaced. in the frozen soil, can replenish it. “The salt is particularly drying,” says Mike Donaroma, owner of the nursery. “It’ll pull the moisture out of the leaf.” Salt used to maintain winter streets can also find its way onto plants. Dried-out leaves won’t kill a plant, but they look bad come spring and take years to grow back. “The main reason we’re wrapping is to prevent salt spray and dehydration,” says DeVane. Evergreens with needles are less susceptible to this desiccation, at least here on the Vineyard, but boxwood and holly, both leaved evergreens, are particularly vulnerable. “The leaves of evergreens get really, really dry, and boxwood leaves are little,” she says. Burlapping is often recommended to shield evergreens against winter sun damage, known as winter burn or winter scorch. Like salt spray, a combination of bright sun and cold, dry, windy weather can make foliage transpire faster than its roots can draw moisture from the frozen ground. But DeVane and Donaroma say that winter sun damage isn’t a problem here for most evergreens, with a few exceptions. “People are using cherry laurel; they have a big fat leaf and tend to scorch a lot,” says Donorama. He feels that the plant, which is native to southwestern Asia and southeastern Europe, is too sensitive for the Northeast climate, but clients like its glossy leaves and sweet-smelling white flowers in spring. “If somebody requests cherry laurels, I’ll insist on wrapping them” – and not just when they’re young or newly planted. “I’ll wrap them forever,” he says. For those not inclined to wrap, proactive planting is the best idea. Ideally, plants at risk of winter damage should be planted in areas not buffeted by wind or subjected to too much direct sun; the north and east sides of buildings, for example, can be best. And newly planted or transplanted plants should be well watered as they head into winter.